Updated throughout w/new Maytag appliances and Countertop in 2018. 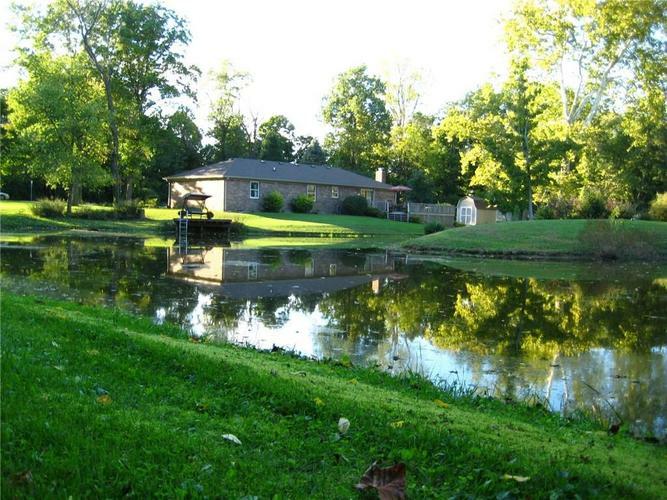 Beautiful 2 plus acres with a stocked pond and waterfall! Large 28'x36' pole barn, electric, covered porch, large garage door to store toys or Ultimate She Shed! You won't believe you are in Avon rural feel but only 20 minutes to the airport 30 to Downtown Indy! Charming brick ranch has 3 bedrooms and 2 full & 1 half-bath. Attached 2 car garage has a service door, storage, and a few hidden surprises! All appliances stay and covered by HSA Home Warranty. Enjoy the beautiful water view doing dishes, laying in bed or sitting in the Family Room. Sip coffee on your 800 sqft deck watching stunning sunrises with tranquil sounds of the waterfall. Rare find! Directions:Dan Jones and US 36 - go West on 36, 1.8 miles to North Co. Rd. 625 E., turn R (North) go half a mile home is on the right. Across from Sycamore Ridge, on the corner.